I’m slightly worried about my new addiction to one of my Christmas presents: Solitaire (the playing card version) in electronic form for my Nintendo DS. At least, the Nintendo calls it Solitaire. To me, it’s Patience – one of the many forms my grandma taught me when I was a child. This version is the one in which you have to sort the cards from a central stack and seven smaller piles into four columns, alternating red and black, each starting with a King and working down to an ace. Only when you turn over a King can you start a fresh column, and you have to complete all four columns to win. You need a certain amount of luck to turn up the right cards in the right order and to avoid fatally trapping essential cards. I’ve been playing it late into the night, when I go to bed or when I wake up in the early hours and need something to soothe me back to sleep. Except it doesn’t send me back to sleep, because each time a game finishes, I start another. Like some compulsive gambler, I have to keep playing till I win. Last night, around 2am, I had a sudden flash forward (if that is the opposite of a flashback?) to a vision of myself, 40 years from now. I’m in an old people’s home, sitting quietly in a corner in one of those hard chairs that’s good for your back. I’m hunched over my Nintendo DS, which is by 2050 regarded as a quaint retro curiosity, given to old people to help them revive their long-term memory. Except by 2050, society will have moved on so that neat King, Queen, Jack sequence will no longer be obligatory. (What is a Jack, anyway?) 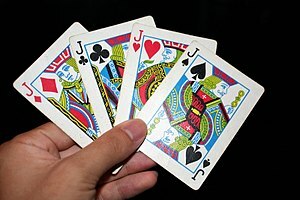 The player will be able to choose to partner Queen and Queen, or King and King, if that reflects their own particular lifestyle. Or President and Prime Minister, perhaps. And there won’t be red and black suits any more, but something less suggestive of racial difference. Blue and green, perhaps, or yellow and mauve, so no-one can take offence (except the colour-blind, who’ll find it much harder to play). But still the excitement of playing will be the same. The requisite element of luck dictating that no matter how skilfully I play, I’ll never be certain of winning. No two games ever the same, however many years I live to play it. And the thrill of the win, the cards falling swiftly and neatly into place as the final matches are made. Who needs any other game? There are worse addictions. After all, as my grandma used to say, Patience is a virtue.